The Dachshund dog breed is known for their loyalty, intelligence, and active personality. They make a great travel companion and also do well with children which make them a great family dog. Dachshunds tend to be very alert with their distinct bark and are restless in nature. The history of the Dachshund dates back to the early 17th century in Germany. Despite appearances, these dogs were not bred to look like wienerschnitzel, but rather, they were designed to be hunters of small game. While they can certainly hunt a mean rabbit, today these dogs are primarily seen as adorable little house pets. In 1885 the Dachshund was recognized by the AKC. 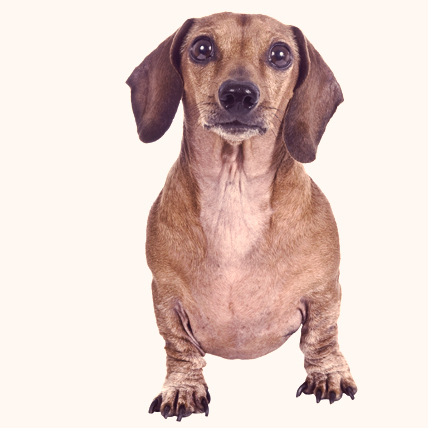 Dachshunds can be broken down into three varieties: shorthair, wirehair, and longhair. Each variety still has the same short legs and long, slinky body. Their head has a long, narrow muzzle, almond shaped eyes, and long, floppy ears. Their body also has a muscular chest and a long, thin tail. Also available in two sizes (standard and miniature), the Dachshund’s height ranges from 5” (a small miniature) to 11” (a large standard) off the ground. While the Dachshund is a smart and affectionate dog, they can be a bit headstrong, often being tough to train and housebreak. The Dachshund needs to know that they are lower on the totem-pole than any human, otherwise they may be guarded and protective around strangers. All of this, however, is avoidable if the dog is not coddled and allowed to run amok. Basic note when raising a small dog: don’t let the dog get away with anything a large dog wouldn’t be able to. Take care of that, and the Dachshund is one of the most pleasant, family friendly dogs around. Dachshunds come in a wide array of colors, from solid black, red, brown, tan, cream, and gray, to bicolor combinations of the aforementioned colors (i.e., black/tan, brown/cream, gray/tan). They can also come in a variety of patterns and tricolor blends (brindle, dapple, piebald).